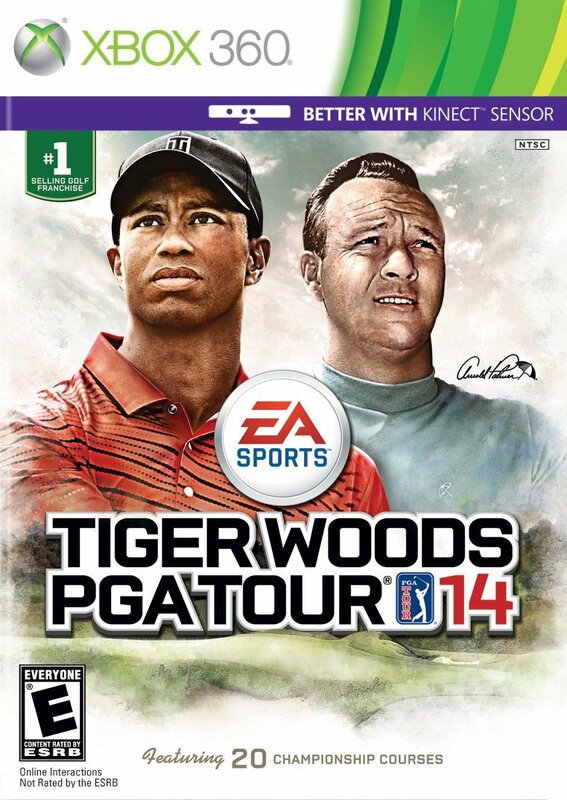 Tiger Woods PGA Tour 14 360 Review. Comparing past incarnations of the game line, this is perhaps the most well put together of the series yet. I truly have a blast playing. When the number one sports game producers EA Games/programmers combine a number one franchise with the Xbox 360 Kinect gamers are in for something special. While the name of the game still bears the moniker of Tiger Woods as a branding, this time around the game does not focus so much on Tiger as it does Golf as a whole. From some of Golfs historic tournaments and even more exciting not just one of the tournaments, but all four of Golf’s majors are represented here. The Masters Tournament, The Open Championship, the U.S. Open and the PGA Championship and The LPGA are wrapped in Tiger Woods PGA Tour 14. I’ve never really thought of Golf in regards to historic events, but Golf indeed has its share of legendary players and events that stir through all of time with the echoes of Golfing Glory. 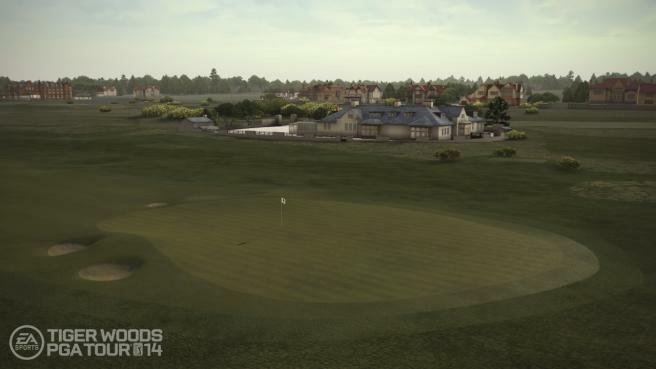 In Tiger Woods PGA Tour 14 players get to try their hand at Golfing historic game moments. 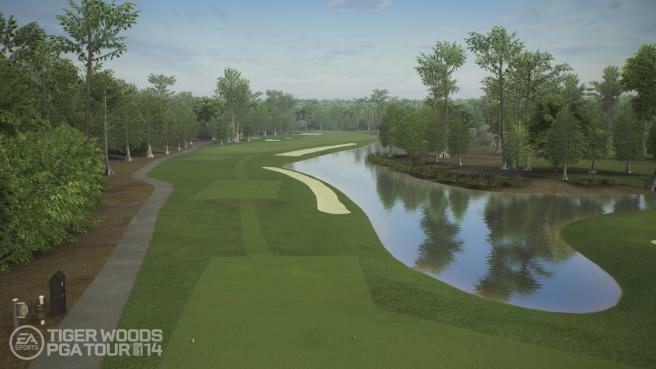 With the intriguing chance to rewrite Golfing history, which is always an interesting and player investing concept for a game, and we are glad to see it here in TWPGA14. Player’s game through history in game includes eight legends of the Sport. The historic players are Seve Ballesteros, Ben Hogan, Bobby Jones, Jack Nicklaus, Arnold Palmer, Gary Player, Sam Snead and Lee Trevino, Tiger Woods… these are just a few of the 32 pros and legendary golfers that are in the game. Further enhancing the experience of taking on these legends, is actually being able to step into their shoes and play as them. Reliving and maybe changing the outcome of some of Golf’s most historic moments in the game’s history. As players go on the more historic parts of the game, they also wear period clothing and use gear specific for the time period. As noted the LPGA is also featured which is a nice refreshing spark in the franchise. While it’s a small thing and not many of the ladies are included…. to have so many options in one game truly makes this a power house of a franchise. It’s amazing what it has to offer players. The lady Golfers number 5 in all. They are Paula Creamer, Suzann Pettersen, Natalie Gulbis, Lexi Thompson and Stacy Lewis. Graphically the game has beautiful visuals. Blue skies, clouds and time of day effects and live weather, so the weather will mirror real life for that course……. furthering the experience the player can enable the time of day option, which means that turning this feature on makes the game time of day sensitive. If the time of day is say noon at a certain course, then it will be noon in the game virtual rendition of that course. Nice. There are so many options a player can change in Tiger Woods PGA Tour 14, that depending on the settings it can be a real game changer. Playing with the settings is sure to give players more of a diverse challenge with this game. Some of those features are also in the customization of your golfer. While such things as creating your own golfer does not really make any game changes other than the pleasure of customizing a golfer…some of the things that go into making the golfers playing style do have an impact in the game. Golfer Swing Styles as the name states lets you set up and play with unique golfing styles. Players can pick their own swing style, there are up to 24 combinations. Then players can add in power or control to their shots. Adding some extra power may give a shot that extra oomph to get closer to the hole. There is a new HUD representing this which is also tied to the aiming arrow. With this it can show the player how much control or power they are getting out of a shot. Now what’s good for the player is of course good for the AI, so the Pro Golfers and Legends all have their own styles and abilities in the game. Playing against any of them, and a player will see them mirror their real world Golf style. Some of the other new features are the new Strike Meter. The strike meter assists the player in those tricky shots. So if there are some slopes, or even right on the fairway, a player can use the strike meter to adjust for the terrain. On lower levels of game difficulty the Strike Meter is simple, as the player advances in difficulty the Strike Meter also becomes harder to handle. A player that is able to use it to great effect has some bragging rights, because they have some skills. The Chip shot is now upgraded as well. When setting up a chip shot, a swing meter is drawn on the ground that is very much like the putting meter, all of the aids are there the player just has to put some skill in using them. 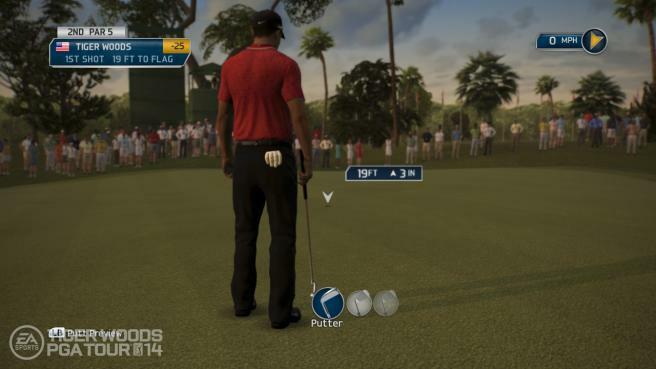 Furthering the package and what Tiger Woods PGA Tour 14 has to offer is its online features. Expanding on past Country Club Concepts and making them even bigger and better. There is also a new section called Connected Tournaments. 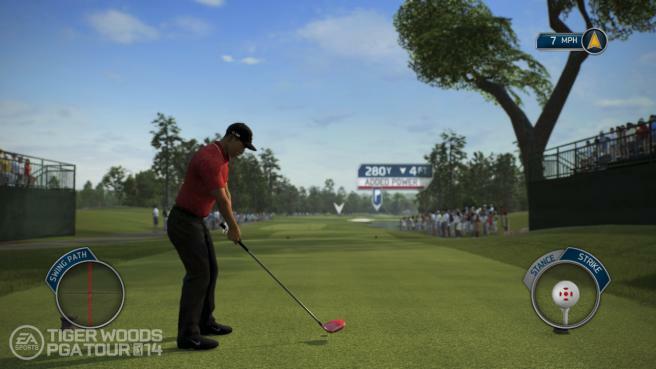 Players are able to see up to 23 real time golf arcs from the competitors on the same course. The online features including chat make it a very social game in its virtual form, as much as it is in real life. Now if this was not enough, if you have the version and the gaming equipment that will allow you to use your body as the controller, then you will be trying your best golf swing and getting a work out in the process. I just do not know why I use so much muscle in the swing when I am not hitting a real ball nor using a real club…but I do. What a work out. In a passing note of minor things I also like about the game, are the saves. Saving in mid game play is always a good thing. Comparing past incarnations of the game line, this is perhaps the most well put together of the series yet. I truly have a blast playing.